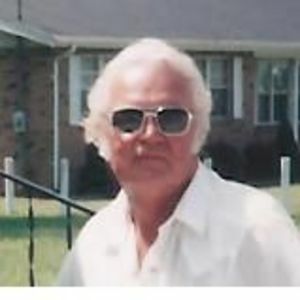 POWDERLY - Gerald Howard McElvain, 75, of Powderly, died Sunday, October 27, 2013 at 11:30AM at Skyline Hospital in Nashville. Mr. McElvain was born April 1, 1938. He was owner of Macs Auto Sales, and he was a U.S. Army veteran and Air Force veteran. He was preceded in death by his first wife, Eva McElvain; second wife Nell McElvain; daughter Tammy Jo Everly; parents Howard and Dorothy McElvain; step-mother Nadine McElvain; and half-sister Willa Dean McElvain. Survivors include his son, Gerald Alan McElvain of Powderly; grandchildren Keith McElvain of Powderly, Kyle McElvain of Sacramento, and Jessi Abshire of Powderly; great-grandchildren Malaci Howton, Joslyn Mudd, Levi Mudd, Ava Ford, Kadyn McElvain, and Kaleah McElvain; half-brothers Raymond McElvain, Glen McElvain, and Butch McElvain; half-sisters Donna Mae McElvain and Shirley Groves; and companion Greta Atherton. Funeral services will be Thursday, October 31, 2013 at 11:00AM at Tucker Funeral Home in Central City, with Bro. Steve McElvain officiating. Burial in Memorial Gardens in Powderly. Visitation will be Wednesday after 5:00PM at the funeral home. Online condolences may be made at www.tuckerfuneralhomes.com. I am so sorry for your loss . Prayers for all family and friends. Jesse so sad for your lost. I know at a time like this there are no words that can take away tha sorrows and grief. Just remember back on your fun and loving memories that you have. May god bless and be with all family and friends. In my prayers. Mac, you were always kind & willing to talk our ear off. I bought many a vehicle from you, but you were just as interested in chewing the fat when I was looking. That motorcycle of yours will now be silent thru the Powderly hills, but the memories will always be there. My whole family was saddened to hear of your passing, but know you're in a better place. So sorry for the family's loss he was a good man..